After a thrilling one point victory over Delta College on Feb 1, the Men’s Basketball team looked to continue their winning streak on Feb 5 when they hosted 10th ranked Oakland Community College (10-1, 20-2). 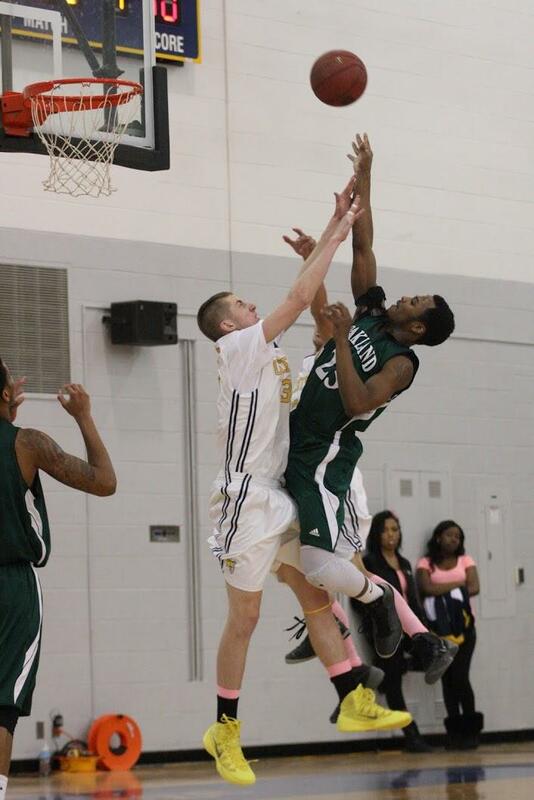 The Raiders who are currently in second place of the Michigan Community College Eastern Conference standings, proved to be both an offensive and defensive challenge to the Ocelots which lost the game 110-68. Schoolcraft fell behind early getting outscored 21-2 at the 14:03 mark. What proved costly for the Ocelots were turnovers. The team had a total of 20 turnovers in the first half which allowed the Raiders to easily elevate their point margin. The Ocelots faced a nearly thirty point deficit at the half with a score of 55-27. The Raiders shot 50% from the field hitting (41-82) collectively; and were 54.4% from free-throw line hitting (24-44). The Ocelots struggled shooting 40.9% making (27-66) and shot only 36.1% from the line (13-36). The Raiders had five players in double digits. Raiders forward Jametrius Wade carried the team’s offense with 23 points, five steals, five blocks, six rebounds and shot 4 of 11 from the field. Despite a valiant offensive effort by Schoolcraft sophomore Terrell Sewell who had 23 points, the Raiders overpowered Schoolcraft. Using the full court press on a consistent basis helped to force Schoolcraft into a whopping 38 turnovers. “They pressed a lot and used a lot of traps which was the reason we lost. We just had a hard time reacting to it,” Sophmore Terrence Coles said. Freshman Basel Ibrahim added, “Chemistry is what we’re lacking. Head coach Randy Henry was visibly upset with the outcome of the game. “We just got overworked….We need to be more competitive. You could just see the embarrassment and anger on the bench of the players. We need to work harder in practice, and increase our confidence.” With the loss Schoolcraft falls to 11-10, and 4-7 in MCCA good for seventh place in the Eastern Conference. With less than five games left in the regular season the Ocelots are facing an uphill battle to clinch a postseason berth.